Circle June 23. A Vote That Day In The U.K. Could Affect Your Wallet : The Two-Way Most economists say an upcoming vote to determine the United Kingdom's role in the EU is a big deal. The so-called Brexit vote might upset trade deals, financial markets and currencies, they argue. European Union and U.K. Union Jack flags hang at a meeting for U.K. citizens living in Germany to discuss the implications of the proposed "Brexit" from the EU. If you're like most Americans, you can only guess. Maybe it's a dozen. Maybe twice that. Who cares, really? Economists do. They care a lot. Most say the EU's current collection of 28 members adds stability to the global economy. If membership were to decline by just one — thanks to the proposed exit of the United Kingdom — then workers and companies all around the world would suffer, they argue. "A U.K. vote to exit the European Union could have significant economic repercussions," Federal Reserve Chair Janet Yellen warned in a speech this week. An upcoming referendum on U.K. membership is one of the "important uncertainties" hanging over the U.S. economy and weighing down on business, she said. 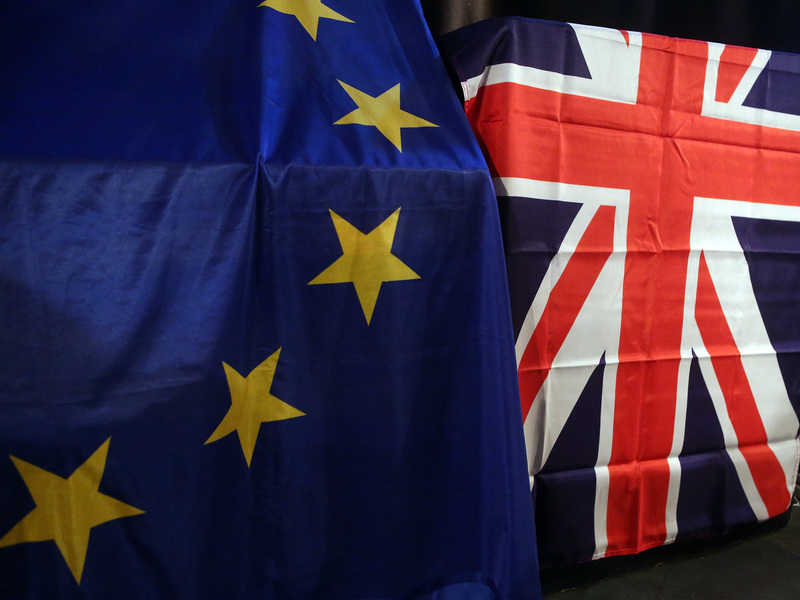 The June 23 vote is on what's commonly called "Brexit," short for a British exit. But it would involve all of the U.K. — England, Scotland, Wales and Northern Ireland, where a total of 65 million people live. If the majority were to vote in favor of "LEAVE," then the EU would lose one of its largest, richest, most influential members. The very thought of that outcome has been rattling financial markets and worrying world leaders. On a recent trip to Britain, President Obama said "the outcome of that decision is a matter of deep interest to the United States because it affects our prospects as well." The EU is a sprawling collection of countries, ranging from powerful Germany to tiny Malta. Each has given up some sovereignty to allow for group decisions. The EU's roots stretch back to the 1950s when a handful of countries began cooperating, hoping to head off the kinds of divisions that contributed to World War I and II. Over the decades, the EU has continued to expand, becoming home to roughly half a billion people. The U.K. has been participating since 1973. But it has been a somewhat reluctant member. For example, it has kept its own currency, the British pound, rather than join in the euro currency. Now many U.K. citizens feel they have given up too much power to EU bureaucrats who have created a complex web of regulations. And many want more control over their borders as migration issues mount. Reduced trade. The OECD, a forum for developed countries to discuss issues, recently warned that Brexit would cause "a major negative shock" in the U.K. by reducing trade with key partners such as France, Germany and Italy. "By 2020, GDP would be over 3 percent smaller than otherwise" in the U.K, the report said. The rest of Europe would see slower growth, too, it said. Because Britons and Europeans are huge consumers of U.S. goods and services, a poorer U.K. and Europe would mean lower sales for American companies. That, in turn, could hurt U.S. investors and workers. Domino effect. No state has ever withdrawn from the EU, but now Brexit could set a pattern. "Once Britain decides to leave, the momentum for dismembering the EU is going to be very strong," Stephen J. Hadley, an executive vice chair of the Atlantic Council, warned recently. Or there could be a different wave of other "exits." For example, Scotland might leave the U.K. to become a stand-alone nation within the EU (like the Republic of Ireland). An "exit fever" could lead to political instability, as well as disruptions in flows of labor, capital and commerce, harming U.S. business dealings. Currency turbulence. London is one of — if not the -- most important global financial centers, and the British pound sterling is one of the world's stable "reserve" currencies. Mark Carney, governor of the Bank of England, told the British House of Commons that Brexit could cause London to lose banking jobs as financial institutions moved operations to the EU and that the British pound would fall in value and respect. Instability in currency exchange rates and financial centers doesn't generally lead to good times for the global economy. But some conservatives say Brexit would spur growth by freeing the U.K. from regulatory overreach by EU bureaucrats. "European Union laws and regulations are increasingly viewed as unnecessary, intrusive and burdensome," said Luke Coffey, director of a foreign-policy center at the conservative Heritage Foundation. "During the period of time when social media, globalization and the Internet are empowering individuals, the European Union is doing just the opposite." Recent Brexit polls in the U.K. have fluctuated, and most experts say the vote is too close to call.